We are now firmly locked into a Pacific Division first-round draw of San Jose vs. Vegas. Should be great hockey. These are two of the best and most fun teams in the entire league, playing high-tempo, high-scoring hockey and generally doing a good job of keeping opponents away from their own nets. The problem with that, of course, is that San Jose’s goaltending is really bad and consequently it’s going to be much tougher for them to put up a fight against this Vegas team. Before the Mark Stone trade, well, they might have had a 50/50 chance to win any given game because while Vegas was still high-tempo and did a good job of controlling play, it wasn’t necessarily all that dangerous as a scoring threat. That meant even if the Sharks put up some high-quality looks for themselves and didn’t get the goaltending, they might still win some games 4-3 or 5-4. Let’s put it this way: Since the trade deadline, Vegas generates more shot attempts per hour in all situations than almost every other team in the league. Only Montreal and Toronto are ahead of them. On the other end, they only give up the fifth-fewest. That’s bad news to begin with, for any opponent, so the fact that San Jose is right behind them in both categories would normally be a little reassuring. But it isn’t because of just how bad their goaltending is. Dead last in the league, in fact. And by a pretty healthy margin. Vegas’s, meanwhile, is fifth in the league over the same stretch. So the fact that the Sharks are high-efficiency shooters is further mitigated. Based on the quality of shots they both give up and generate, Vegas-plus-Stone has the highest expected PDO in the league at a shade under 101.4. That is, a league-average team that took and conceded the exact set of shots the Knights took and conceded since the deadline would be EXPECTED to have an insanely high PDO — and because this team’s talent level is significantly better than average, they’ve exceeded even that level. Vegas is second in expected-goals-for per 60 since the deadline, and first in expected-goals-against. Just incredible. By comparison, San Jose is fifth in expected offense but 18th in expected defense. The Sharks’ quality at both ends notwithstanding, their expected PDO is 99.93, which is about what you’d expect for most clubs anyway, and they underperform that appreciably because of that poor save percentage. No wonder, then, that San Jose is limping into the playoffs with one win in its last 11 games, and that in overtime, before finally (barely) beating Edmonton last night. You can outshoot your opponents all you want, but if you’re arguably as likely to win or lose if you pull the goalie at puck drop, what’s it matter? It doesn’t matter that Vegas is on a bit of a skid of their own — having recently snapped a five-game losing streak but then lost again to Arizona — because they’re likely good enough to overcome even decent-sized hiccups like this in the grand scheme of things. 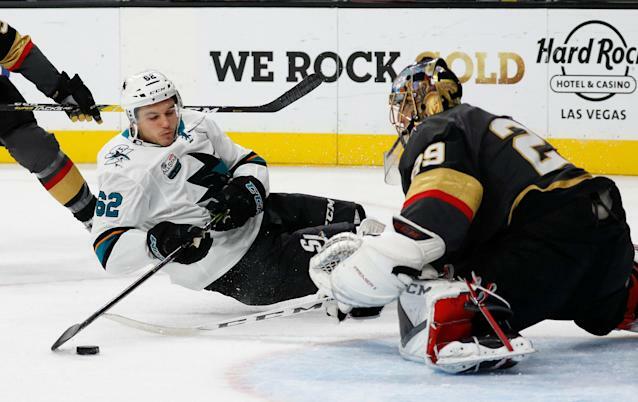 And that’s the real problem here: Vegas is so good both on paper and on the ice that the Sharks’ talent likely can’t overcome the goaltending problem. Even if the Sharks had somehow drawn the Flames instead of the Golden Knights, the fact that it would have been Mike Smith and David Rittich standing between them and some wins makes a huge difference. Either one of those guys could have two or three bad games and it’s no big surprise. Marc-Andre Fleury hasn’t had the kind of year he did in the Knights’ inaugural season, but he’s been pretty good and “pretty good” is plenty good against a club that’s looking at a team save percentage in the .880s for the year. The fact that San Jose is the home team in this series tells you exactly how good they are and have been since Day 1, despite the fact that most teams have AHL goalies who could have outperformed Martin Jones and Aaron Dell. If they could have drawn Dallas or Colorado, forget it, I’m still booking them for the second round. But because it’s this Vegas team, specifically, means they’re probably dead in the water. It would take an incredible effort from the position players to overcome the deficiencies in net. Or, I guess, an incredible reversal of fortune in the crease. But the odds that it happens against Vegas, an elite quantity AND quality team? They seem pretty slim. And if a flaw this obvious is what ends this Sharks era a round or three earlier than it should have, that’s a real shame. But it was avoidable, both if the team went out and got a goalie at any point this season, and if they hadn’t drawn Vegas in the first round. Now? More likely than not this team gets sent packing much earlier than they deserve.